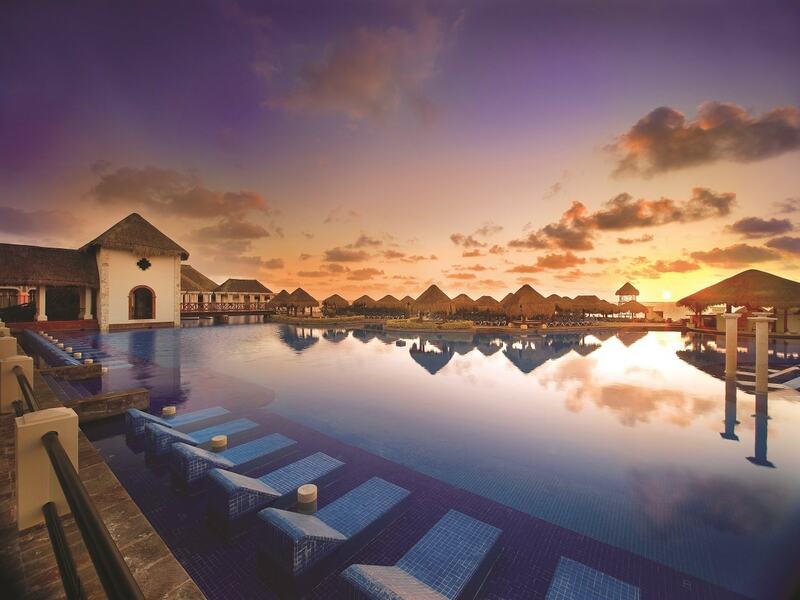 Now Sapphire Riviera Cancun All Inclusive Hotel - Save Big! Top shelf spirits, 24 hour all inclusive service and luxurious accommodations. You will never want to leave the Now Sapphire. Whether you are single, a couple or planning a family vacation, the Now Sapphire is a fabulous resort with a lot to offer. The unlimited luxury concept ensures gourmet dining at 7 restaurants with no reservations required. Top shelf spirits, premium beers and fresh fruit juices along with 24 hour room service ensure that you are always refreshed and satisfied. A full range of daytime and nighttime activities, a fitness center as well as a kids club and teens club ensure that every age has something fun to do (if they choose to!). CONTACT US for rock-bottom rates! 496 ample suites are awaiting. Sit back and relax on your terrace or balcony. Every suite has a king bed or two double beds, as well as a spacious bathroom. The included mini-bar is stocked daily and the room service is available 24 hours. Bathrobes and slippers will only add to the feeling of luxury you get stepping into these suites. Choose to upgrade to beach front options or the preferred club for extra amenities and extra services. The unlimited luxury concept at the Now Sapphire eliminates the need to make reservations at any of their 7 restaurants. Enjoy gourmet dining where you want, when you want. Specialty restaurants include: Mediterranean, Seafood, French, Mexican, Asian and International. Top shelf spirits are included and available as as premium beers, sodas, fresh fruit juices and a premium coffee bar. With a dedicated wedding department, your every need will be attended at the Now Sapphire. With a specialization in South Asian Weddings as well as other destination weddings, you only need to decide on a date. Get in touch for more information. The Explorer's Club is the kids club that your children will never want to leave. With activities geared towards kids aged 3-12 that include games, camping night, movies, and outdoor and indoor spaces, the little ones will be entertained and happy while you deserve a well deserved break. The ultimate hang out spot awaits the teens from 13-17. A video games room with Xbox, Wii and Playstation 2 awaits as well as plasma TV's. If they are feeling active they can participate in sports, water games or pool, ping-pong and foos ball. Night time 'mixers' are also organized so that they can mingle and meet new friends. 1950 square feet of Spa space are waiting to indulge you in a range of treatments. Massage, facials, body treatments, salon services and more. You can mix business with pleasure at the Now Sapphire. Contact us to get the best group rates. Enjoy a complimentary green fee at the Grand Coral Riviera Maya Golf Club.